Due to the divine guidance of Jeevanpran Shree Muktajeevan Swamibapa and Acharya Swamishree, the lives of many people of the rural Panchmahal region have been transformed. Their teachings of true morality have led countless people onto the path of spirituality. 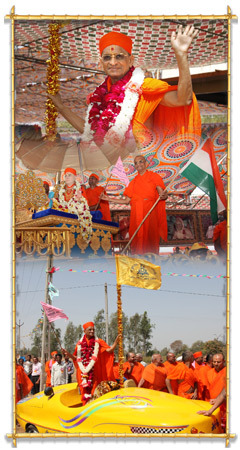 To further spread the teachings of Lord Shree Swaminarayanbapa Swamibapa and Acharya Swamishree to the masses, a rally was held on Sunday 4 March 2012, as a prelude to the Shree Muktajeevan Swamibapa Panchmahal Padarpan Shashtipurti Mahotsav. Having received the signal from Acharya Swamishree, the rally commenced from Shree Swaminarayan Mandir Vaghjipur at 11.30 am, and toured a route of 101 kilometres. The rally finally returned to the starting point 6 hours later. Taking part in the rally were over 1500 motorcycles, 300 cars, a grand chariot upon which Jeevanpran Swamibapa was seated, a sports car, and an open truck on the back of which sat Shree Muktajeevan Pipe Band London. The rally passed through the main streets of Vaghjipur, then went to Tarvari, Bakhar, Dhobi, Bodidrabuzarg, Orvada, Nandapura, Kevadiya, Chanchlav, Erandi, Gadh, Chundri, Dhobkuva, Parvadi, Vavdi, Godhra, Popatpura, Khandiya, Nava-mirapur, Kimarpur, Dalvada, Tadva, Dokva, Shahera, Salampura, Dhadhalpur, Sureli, Nandarva, Gangdiya, Sajivav, Boriyali, Nada, Khojalvasa, Matariya Bas and Dhamhod, before returning to Vaghjipur. At the temple, Acharya Swamishree once again gave darshan to all the participants of the rally. An estimated 6000 disciples had taken part in the rally. As the rally passed each of the main villages and cities, local dignitaries of each region came to offer garlands to Jeevanpran Swamibapa. At the main centres, Shree Muktajeevan Pipe Band marched and performed patriotic melodies. Dignatories also garlanded the Pipe Band Drum Majors. When the rally returned to Shree Swaminarayan Mandir Vaghjipur at 5.30 pm, Acharya Swamishree greeted all the participants.